Chop up all the chocolate into small pieces and put them in a mixing bowl. In a saucepan, mix cream and Baileys and heat until it just starts to bubble. Pour heated cream over chocolate. Mix until chocolate are melted and the resulting blend becomes silky. Let it cool in the refrigerator for a few hours or, better yet, overnight. Ball up small pieces with your hands into bite-sized chunks. These pieces will soften a little, so set them aside in the refrigerator again to solidify. 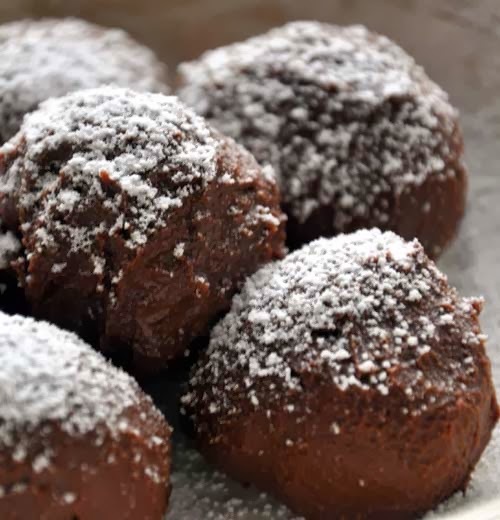 Decorate with confectioners' sugar before serving.